To be eligible for the CCFS credential, you must meet the criteria for A, B, or C below. Have a bachelor’s degree in food science or environmental health from a degree program accredited by the National Environmental Health Science and Protection Accreditation Council, and one year full-time work experience in food safety management, instruction, compliance, or enforcement. Have bachelor’s degree with 30-semester hours core science, and at least two years full-time work experience in food safety management, instruction, compliance, or enforcement. Degree must be from an accredited institution of higher education or equivalent if a foreign institution. Have a bachelor’s degree from an accredited institution of higher education or equivalent if a foreign institution, and at least five years full-time work experience in food safety management, instruction, compliance, or enforcement. Have an associate's degree in science from an accredited institution of higher education or equivalent of a foreign institution, and at least five years full-time work experience in food safety management, instruction, compliance or enforcement. Have a Registered Environmental Health Sanitarian (REHS) or equivalent credential in good standing, and one-year full-time work experience in food safety management, instruction, compliance, or enforcement. Have a Certified Professional Food Safety (CP-FS) or equivalent credential in good standing, and two years full-time work experience in food safety management, instruction, compliance, or enforcement. Applications must be completed and returned to NEHA for review at least 4 weeks prior to the exam date. If an application is received less than 4 weeks prior to when an examination is being given you may have to schedule the exam for another date. Official College Transcripts or official high school transcripts or GED. To be considered an official transcript it should be received at the NEHA office in the sealed envelope from the schools Registrar’s Office/Transcript Office. Third party review (applicable for foreign candidates). The CCFS credential not only helps one to prove competency and capability throughout the food manufacturing and processing environment, but also demonstrates to one’s community and employers that the individual is competent, properly trained, and equipped to carry out his or her duties. To sit for a credential exam an individual must possess certain requirements — a set level of education, experience, or a combination of both. The CCFS examination consists of a total of 135 multiple-choice questions. Of the 135 questions, 120 will be scored. The remaining 15 are unscored, pilot questions. Those items will not be called out to candidates during the exam. Candidates are given a total of two and a half (2.5) hours to complete the exam. Below is an outline of the seven (7) different content areas the examination covers and the percentages allotted to each of those areas. Please use this outline as a guide when preparing for the examination. NEHA will email you an authorization letter when your application is processed as approved. The letter will have your Pearson VUE ID number and the Pearson VUE website to schedule a testing time. After scheduling your exam with Pearson VUE, please verify the information is correct and read the Pearson VUE Testing Center policy in your e-mail confirmation. On test day you must bring two forms of personal identification (i.e. driver’s license or passport and one other form of ID). Please contact Pearson VUE if you have any questions regarding what forms of identification are accepted. NEHA will send an admission ticket approximately 2 weeks prior to your test date. The admission ticket will detail the exam date and location, reporting time, and starting time. Those that do not appear on the date of the exam at the appropriate time will forfeit all exam fees. Persons arriving after the examination has started may not be admitted. If you lost your admission ticket or have not received an admission ticket at least 2 days prior to the test date, please contact NEHA immediately. Only approved candidates will be admitted to the exam. No walk-in applicants will be admitted. On test day please bring with you your admission ticket, photo identification (i.e. driver’s license or passport), and sharpened #2 pencils. Below is a list of study references that are recommended to assist the candidate in preparing for the CCFS Credential examination. NEHA is committed to ensuring that no individual is deprived of the opportunity to take a credentialing examination solely by reason of a disability or impairment. All test centers are fully accessible and compliant with the American with Disabilities Act (ADA). To make a request for special accommodations you must complete the Accommodation Request Form and Documentation of Disability Related Needs Form including the specific diagnosis of your disability; medical records, or other written proof of the diagnosis by an appropriate licensed professional; and the type of accommodation being requested. All form and documentation must be returned to NEHA at least 8 weeks prior to the scheduled test date. To receive a copy of the form please contact Credentialing@neha.org. If the forms are not returned to NEHA within 8 weeks prior to the scheduled test date your request for special accommodations may not be honored or may be delayed. With respect to all matters related to testing accommodations, NEHA will only communicate with the candidate, professionals knowledgeable about the candidate’s disability or impairment, and the candidate’s authorized representative (if applicable). It is strongly recommended that you read NEHA’s Credentialing Handbook: Guide to Policies and Procedures for NEHA’s Credentialing Programs. 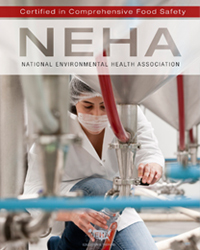 This handbook outlines all the policies you are expected to follow by being a NEHA credential holder. The handbook also outlines in further detail the procedures for applying for a credential, submitting continuing education, and maintaining your credential. If you would like to request a hardcopy of NEHA’s Credentialing Handbook, please contact the Credentialing Department at (303) 756-9090 ext. 310, or email credentialing@neha.org.